Happy New Year to the Over the Big Moon readers! I’m Rebekah from Charming Imperfections and 2016 is going to be a big year for us! With a little one coming this summer I have some pretty huge DIY goals and resolutions, one of which, I’ll be sharing with you today. 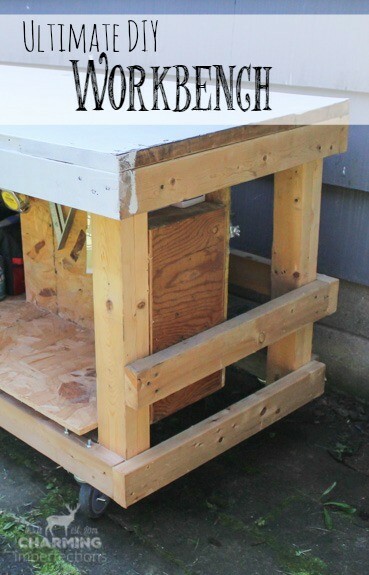 I’ll bet you have some DIY plans this year as well, so keep reading to learn how to build a workbench for all of your DIY projects! We all want to start the new year with more organization so that our projects and life can run efficiently and we can accomplish even more than the year before, however, there’s one area that tends to get overlooked (in my case at least). 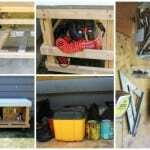 My project space in the garage was constantly flooded with tools, lumber, and supplies that could never seem to find a home. I needed a work surface and tool storage area and decided to make one on my own. Now, to start, I already had a table, but if you don’t have one, don’t worry, I’ll give you a quick description on how to put one together. *Measurements are subjective to the size of door you find. Be sure to take your own measurements before making cuts! 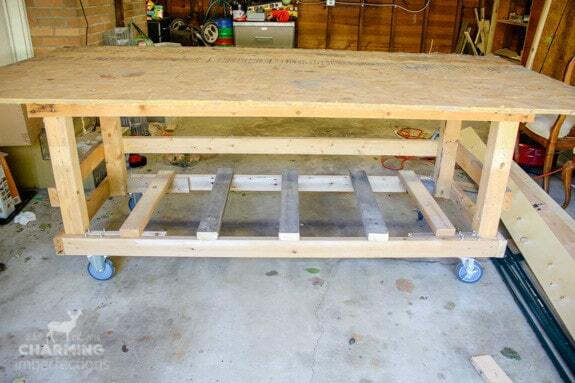 Building the basic table is simple. Since I did not personally build mine, I don’t have pictures of the process. If you have any questions, don’t hesitate to comment or email me. 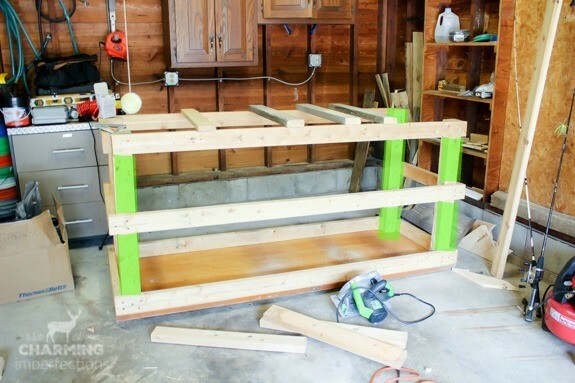 Start by making a long rectangle out of two long and two short 2x4s that will act as a skirt for your door or table top. This part is highlighted in green in the picture below. Screw the door (table top) to that and flip it over. Then attach the 4×4 legs to each corner of the skirt. Next, give the legs some extra stability by screwing in two short side boards and one long board in the back. Leave the “front” open, though! 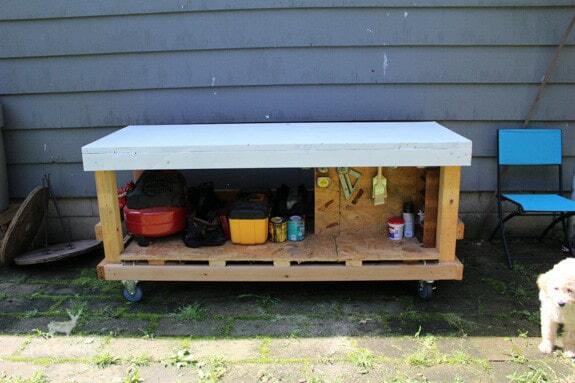 Now, you have the table that I started out with and, it’s a decent workbench, but doesn’t give storage space or have the ability to move. 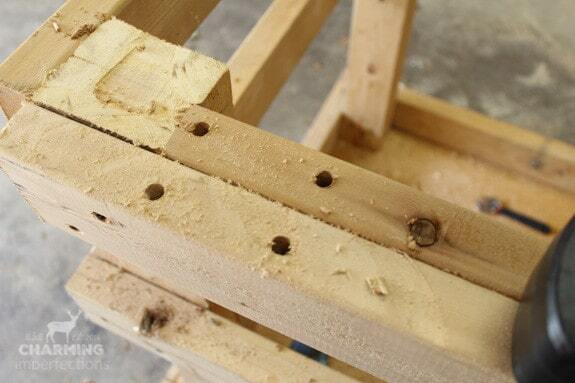 Add a final rectangle of 2x4s to the very bottom of the legs of your table. 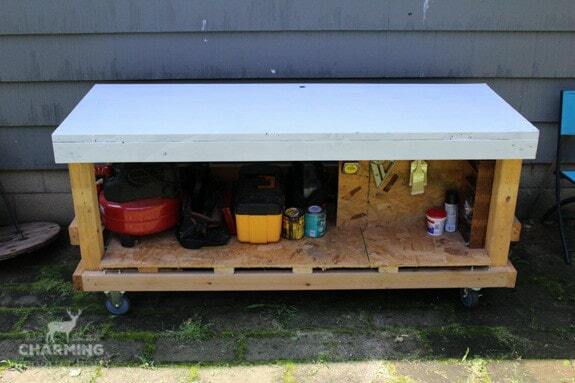 This is where your tool shelf will sit. 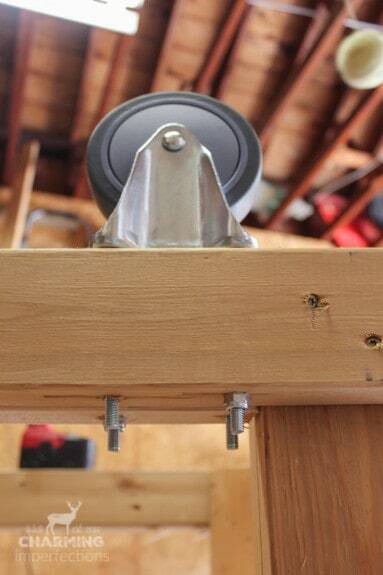 While the table is still upside down, now is a good time to attach the caster wheels. 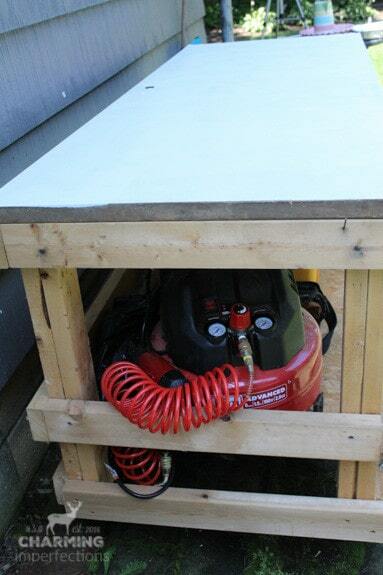 If the plate on the wheels is wider than 2” you may need to add an extra six inch long 2×4 to each corner. Now flip the table around (easier said than done) and cut at least five 2×4’s into 2’5” boards (measure the width of the bottom rectangle to be sure they’ll fit). Screw those into the bottom “layer” of your table. 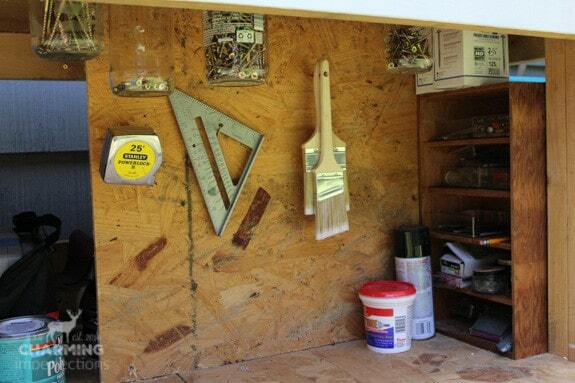 Last, cut out a piece of plywood to fit over those 2×4’s to make yourself a nice big shelf to set tools on. Now, it looks pretty good the way it is, but I added a few extra features to mine. Another bit of plywood was screwed in vertically to make a divider and place to hang things. I also shoved that cute shelf found in our house into that space for the little bitty things like staples, drill bits, and the like. 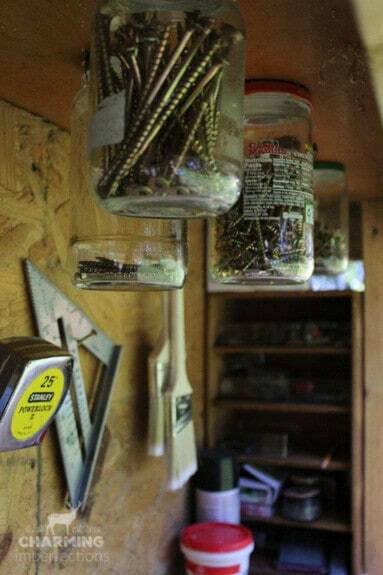 A great way to store screws and nails is by screwing the lid of a jar onto the underside of the table top. Fill the jar, label it, and once screwed into its lid, it will hang out of the way but easy to access. This DIY workbench changed the way I do projects. I never feel like I’m wasting time running to get tools or looking for lost supplies because they are all right there under the table! I’ll often roll the whole thing out to the fenced in backyard so my child can play safely while I work. 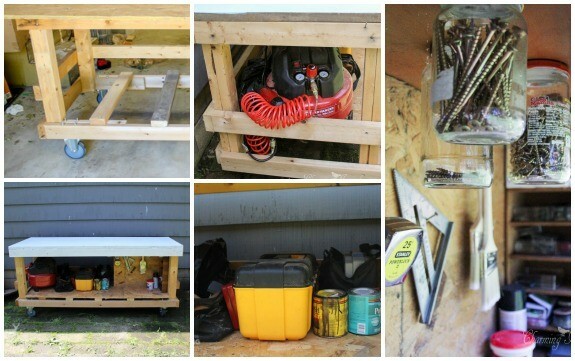 Making an ultimate workbench like this one will get you on track to completing all those 2016 DIY Goals!